I had an artist play date last weekend. My friend and I played with molding paste and stencils. I shared with her the technique of creating texture by spreading molding paste over a stencil. The only bad thing is that the paste takes a while to dry. We used a hair dryer to speed things up. We decided to create a collage using a canvas board, paper and paint. My friend has an extensive stamp collection so she used stamps on her project as well as paper. I tried 2 different stencils on my board. 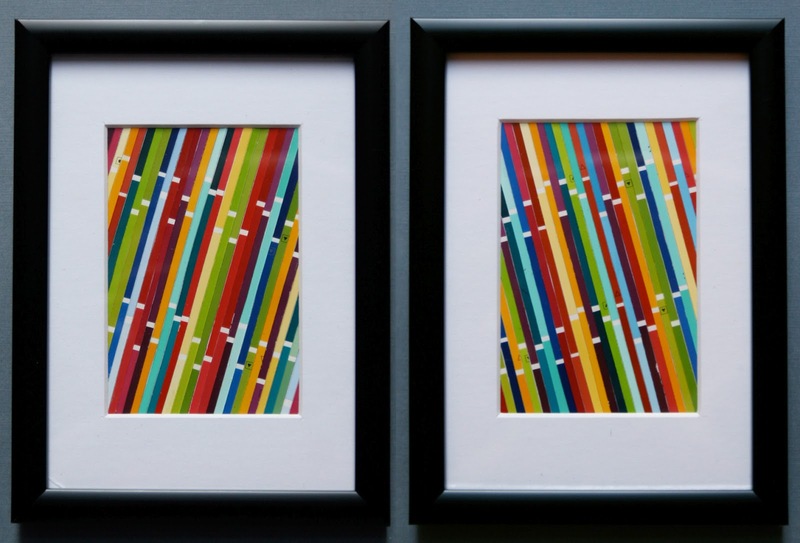 One worked well (the flowers on the right) and the other one did not look as good (squares on the left). I painted over the dried molding paste with Golden fluid acrylics. 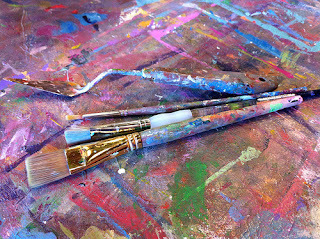 I love having art play dates with my friends. We each have different kinds of items in our artists stashes and it fun to share new things. Luckily, I have 2 more play dates on my calendar already. Last year the art teacher at my son's junior high did a cool 3D art project involving paper rolls. I asked her if she had any paper rolls left over and she kindly gave them to me. I painted the rolls with gloss medium, added black acrylic paint to the ends, then set them aside for many months. I just found them again last weekend. My normal inclination would be to contemplate possible projects for a few weeks before creating anything, but instead I decided to just get something done right away. I created 2 pins - one for me and one for the art teacher. A completed project is a wonderful thing. A friend and I decided we wanted to make t-shirt necklaces after she scored a bag full of old white t-shirts last summer. First we dyed the shirts, an activity that sounded more fun than it actually was. We chose purple, black, red, green, and blue. It took until this month for my friend and I to get back together to play with the newly dyed shirts. I started by cutting them into 1 inch strips using my rotary cutter. From what I read online, using the rotary cutter is key to making the material curl properly. Next we pulled out all sorts of supplies: beads, ribbon, buttons, waxed linen, thread, wire, chain, brads, and rubber o-rings. We played for about 3 hours. Here are the results. My friend and I had fun with this "instant gratification" project. Go to Pinterest for more ideas of what can be created with old, cut up t-shirts. My office is between the bathrooms and the copy room. As you can imagine I see a lot of people walking by throughout the day and the opportunity for chatting makes my office quite pleasant. Unfortunately my desk looks upon a boring, white, cement brick wall. I considered asking if I could paint the wall, but I thought I would be told no. I also considered painting it without asking, but decided that was a bad idea. So I have been decorating the wall with bits of art that I created. Right now the wall has a tree motif. Last winter I decided that the tree looked barren so I added the 3 birds. Those were not enough birds to chase away the winter blues, so I recruited other people in my office to make birds at lunch one day. I brought the supplies and the template (I wanted all the birds to have the same shape) and another 8 birds were hatched. 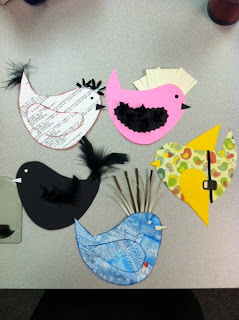 I made 5 more to represent all the people in my department - they know which bird belongs to whom. The tree looked nice and full once all the birds were added and people dropped in to visit their birds occasionally. After awhile, I tired of the birds (who frequently fell off the tree) and returned each to the person who made it. The tree is going to come down soon as well, since I am working on another piece to hang in that spot. My director can see the wall from his desk as well. I hope he likes daisies. I was asked to donate some art to a fundraiser and I decided to make 2 bracelets. These bracelets are made from fabric and buttons. I use a hair tie as a closure. It takes me many hours to make one, even though the pattern is quite simple. I enjoy the challenge of sewing tiny scraps of fabric together and then arranging the coordinating buttons. I tried something new and added a zipper to another bracelet. I am not very happy with the way it turned out. The zipper sticks out when the bracelet wraps around my wrist. I think I will have to glue down the zipper to make it wearable so I will just keep this one rather than sell it. Even though I am not thrilled with my zipper bracelet, I am glad I tried something new. I often think about things I want to try, but I have difficulty executing my ideas. Sometimes I think about the idea for so long that I talk myself out of actually trying it. I have 2 black and white bracelets to make for friends in the next few weeks and I want to try adding some ribbons this time. I hope they look good. Last weekend I went to downtown Chicago for the Renegade Craft Show. It is held in multiple cities across the country and even has a website (click here). It took me about 4 1/2 hours to look at all the booths. 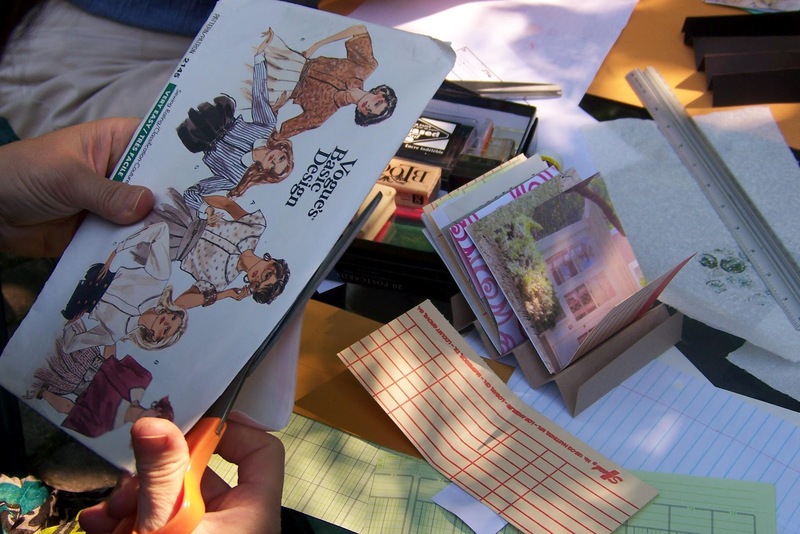 They were filled with fun and wonderful items from posters and cards to vintage clothing, soaps and silver jewelry. 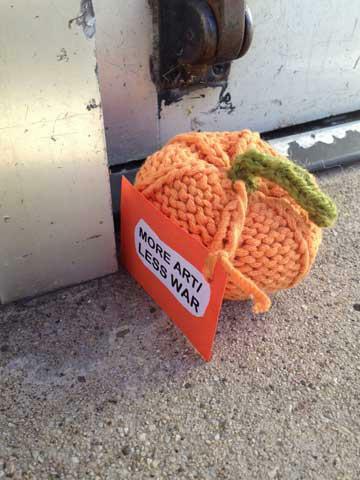 Many of the crafters were from out of town - LA, Austin, and even Oregon. Of course food was available at Renegade and one participant was a vegetarian restaurant named Mana. It happens to be my daughter's favorite place to eat downtown. I had an amazingly good slider made from brown rice and mushrooms. Mushrooms have never been my favorite food - my mother made me eat them - but these sliders are worth the long drive downtown. One thing I didn't expect to hear at a craft show was a loud scream followed by a person saying, "oh, it's just another zombie." There was a group of people who were covered in fake blood enjoying a zombie apocalypse game. Apparently there was a zombie hunter in the crowd and I believe he dispatched all of the zombies without loss of human life. The zombies were last seen boarding Chicago public transit. Craft fairs are a great place for people watching. I saw some adorable outfits, all styles of boots, and lots of scarves. I hope I was able to blend into the hip, urban crowd just a little. ICAD stands for Index Card A Day. I discovered the idea when I was reading the Daisy Yellow Blog I mentioned in the last post. 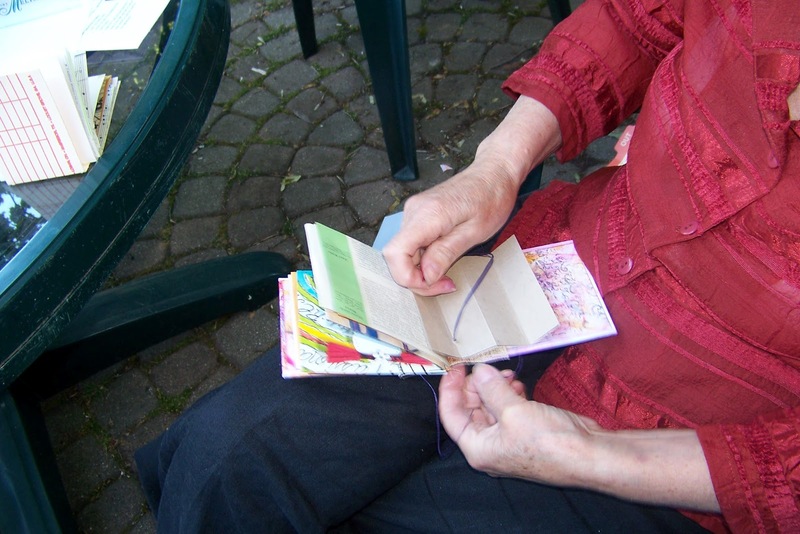 The idea is that you make art on an index card every day for some period of time. It can be any type of art on any size index card. I really wanted to try this because I thought it would be a good challenge that would force me to be creative every day. Of course, I had to recruit some friends to do it with me so that the peer pressure would keep me going. I was able to talk about 8 friends into joining my ICAD group and we agreed to a month long challenge. The project would culminate with a final celebration at a local watering hole where we would share our results (yes, I was able to slip wine into my artistic challenge). I admit that I was not able to create 30 pieces of art in 30 days. I completed 25 index cards. I decided to make each piece different. 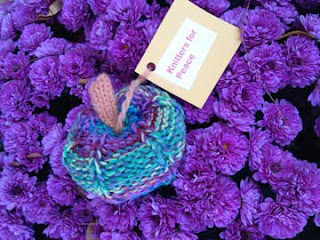 Some participants kept a common theme, such as pictures of flowers. One person chose greeting cards as her art form. Another friend drew the same tree in her backyard each day, using different tools and colors, while another decided to make 3D objects out of her cards. It was an inspiring month and I really loved getting together to share all that the group had made. Golden fluid acrylics - such bright colors! I hope my friends will join me in the future for another ICAD project. 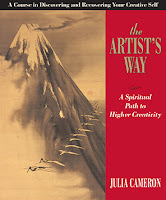 This morning I am reading Chapter 6 of The Artist's Way entitled "Recovering a Sense of Abundance." I am actually getting goosebumps as I read it, because the message is so timely. I have been in the doldrums lately and these thoughts remind me that I need to treat myself better. I am going to post quotes from the chapter that resonate with me. Julia Cameron goes on to write that creativity requires the luxury of time (even if it's only 15 minutes) and space (even if it's only 1 bookshelf). "Creativity lives in paradox: serious art is born from serious play." (p.112) She encourages treating yourself to all kinds of little luxuries that make you feel good, whether it is fresh raspberries, cut flowers or tickets to a play. Finally she asks the very pointed question: what gives you true joy? I have to pause and concentrate to come up with an answer. Perhaps I don’t want to be too extravagant. 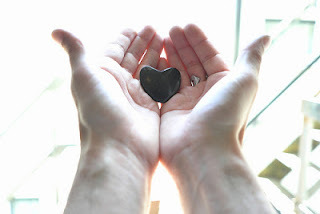 My list includes chocolate, time with my children, and a walk through a sunny tree lined park. Boy, am I lucky – I can experience all of those things today if I plan well. So I am off to fill myself with some joy and snap out of my little funk. Think about the things that bring you joy and try to experience one today. I go to the Kane County flea market a few times a year. I rarely buy anything, but I have fun looking at all the paraphernalia and all the people. I have a friend who works there and that makes it even more fun to visit. Today I saw lots of exciting ephemera which I wanted to buy but have no place to store and no idea what to do with. I controlled my urge to purchase all these things, but imagine the art that could be created. By the way, I did purchase a book of sheet music just in case I find myself lacking in collage material some day. What do you love to buy at the flea market? 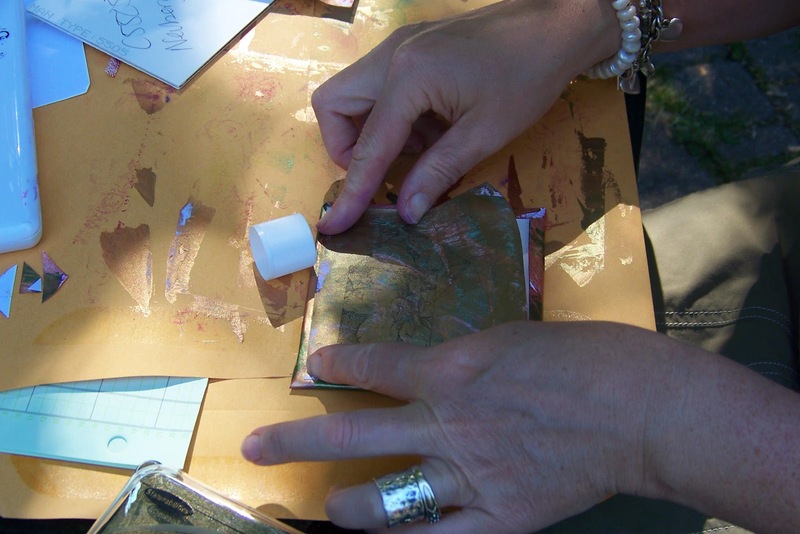 This week I taught some friends how to make a book. My friends have a mother/daughter art group that meets once a month to exercise their creativity. What a wonderful idea! 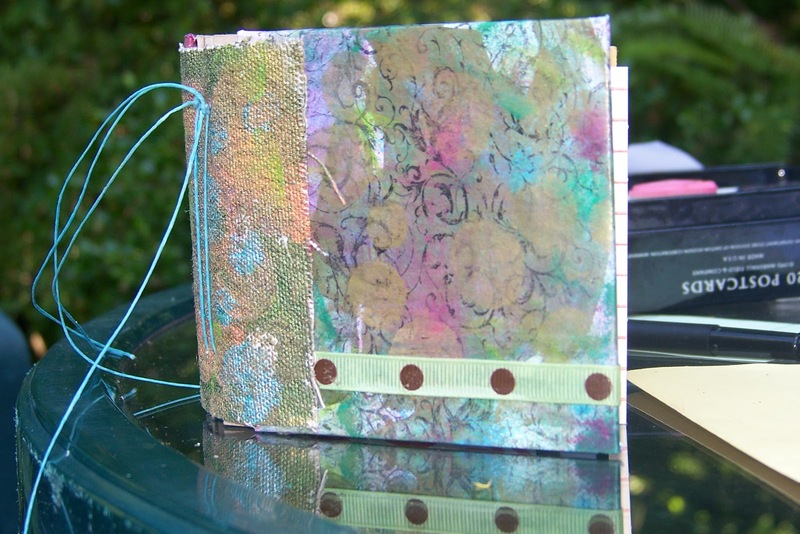 I was invited to teach them how to create a small 4” x 4” book using decorative papers, matte boards, and a canvas spine. 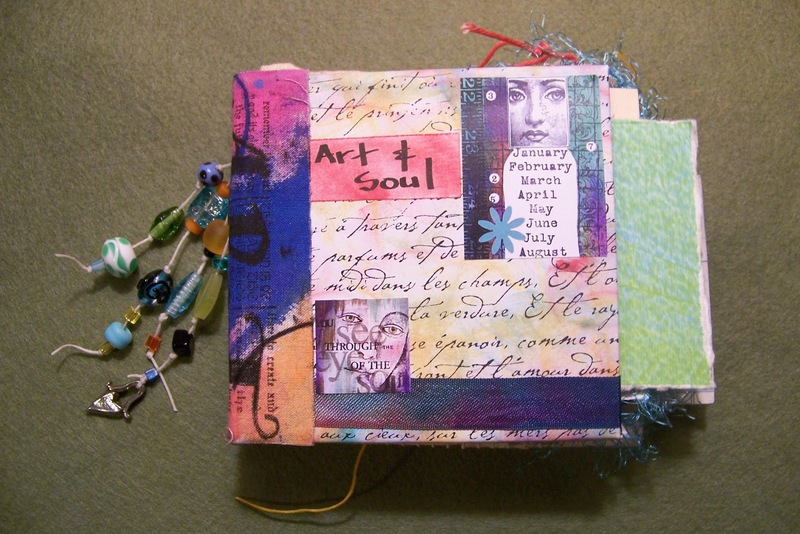 I learned to make this book at Art and Soul. This was my first opportunity to teach a book project. I wrote very detailed directions – with photos – but I wasn’t sure how long the project would take. It ended up taking 4 ½ hours. My students were experienced crafters and they took lots of time being colorful and creative. The end products were fabulous. I can’t wait to teach this class again.